I am in Tennessee for work so will give a brief report on my travel so far. First of all, apologies to those of you (Tim) that I freaked out when you thought I had another fire right before my trip. No, those were PAST fires. I haven’t had a really good one since the grease fire in October. I would like to give some appreciation to the Denver airport for their art on display. In the bridge to the A Concourse, they have several cases of Colorado art and design. I have taken the time to walk up both sides now and look at everything, the exhibit is mostly geared toward design but it is well worth looking at. Then I would like to tell you that if you are going to eat on A Concourse, stay away from Panda Express’ veggie spring rolls, which have absolutely no taste or texture. The hot and sour soup was a very mediocre version but it was leaps and bounds above the spring rolls. There are not a lot of good places there at the hub on A, I would go out to C and get a calzone if you have the time. Our first meal here in Nashville was at Caney Fork River Valley Grille. This is pretty close to our hotel, and we gave it a try. Our party had the chopped steak, the filet, and the Camp Fire Fish Fry, consisting of Southern Fried Catfish, fried shrimp, Fried frog Legs, Fried Cod, a crab cake and some hush puppies and some french fries. Plus two sides: fried okra and baked beans. Two of us shared this and it was still too much. 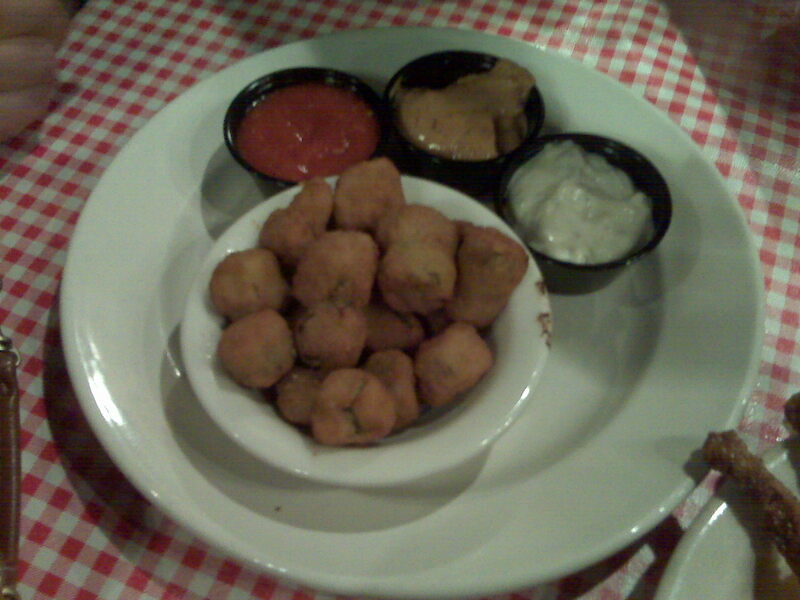 Fried okra and various dipping sauces. 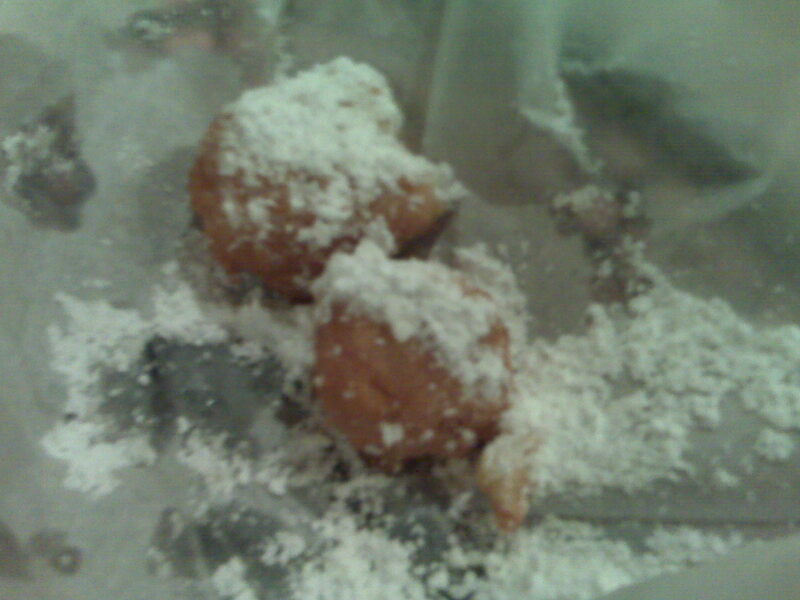 Plus, at the beginning of the meal they bring you fried corn fritters with powdered sugar. Sorry, I took these pictures with my phone and they are not the best. The best thing was the frog legs. They were really quite good. The catfish was fine, the okra was very good and fresh, but the cod had way too much breading, it was better when I picked it out of the breading. The baked beans were also excellent. And the corn fritters were good. Even splitting this between two of us, it was too much food. The restaurant also had an excellent version of Long Island Ice Tea “Backwoods Tea” which was very good and about half as expensive as the ones at our hotel. Plus they had many interesting stuffed and mounted animals on display, including many deer with “atypical” racks. So I would recommend it if you like a place with character. If you are a vegetarian, maybe not so much. Please pardon any random capitalization, I have been at a reception where there was Wine. This entry was posted in Restaurant reviews, Travel and tagged Food, Nashville, restaurant reviews, travel by glenderella. Bookmark the permalink. 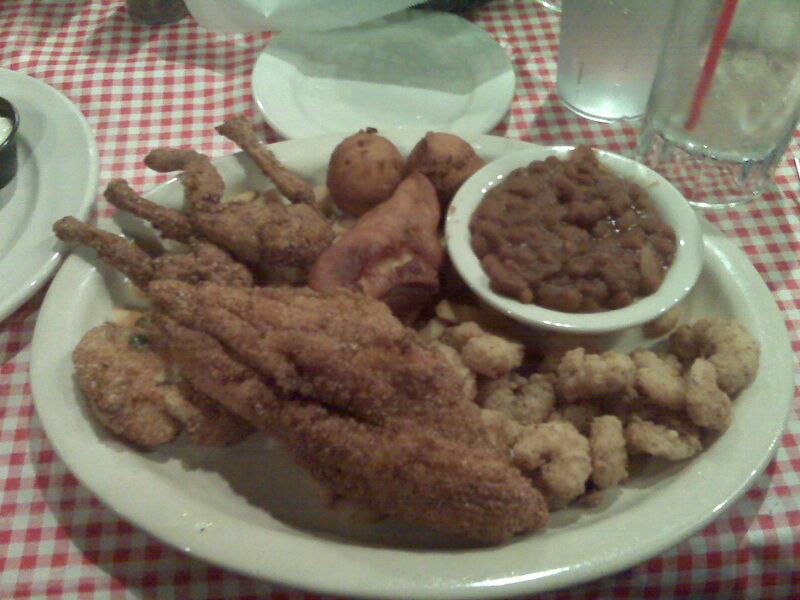 That is one thing that I really miss about living in Louisiana… the catfish places. Hush puppies, catfish, tater tots, cole slaw… YUM!!! Eueuwwwwww, frog legs? You do eat some strange things! Why weren’t the beans fried?